Brooks and I started out by asking ourselves questions about what this wedding would mean and what kind of marriage it would honor. Our community is hugely important to us, as is our commitment to finding a gentle way to live on this planet, so our goal was to find a balance with these two priorities in sight. 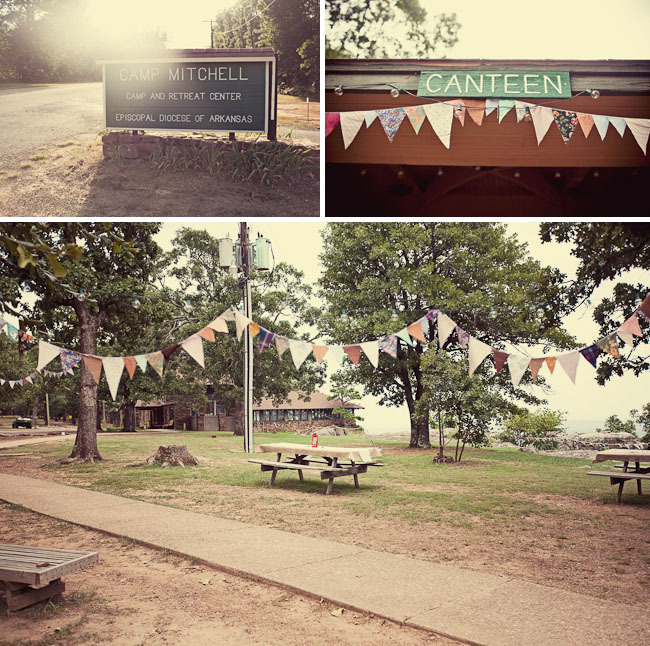 Having the wedding at Camp Mitchell was a given, as it has been an important place in Brooks’s life and our relationship. 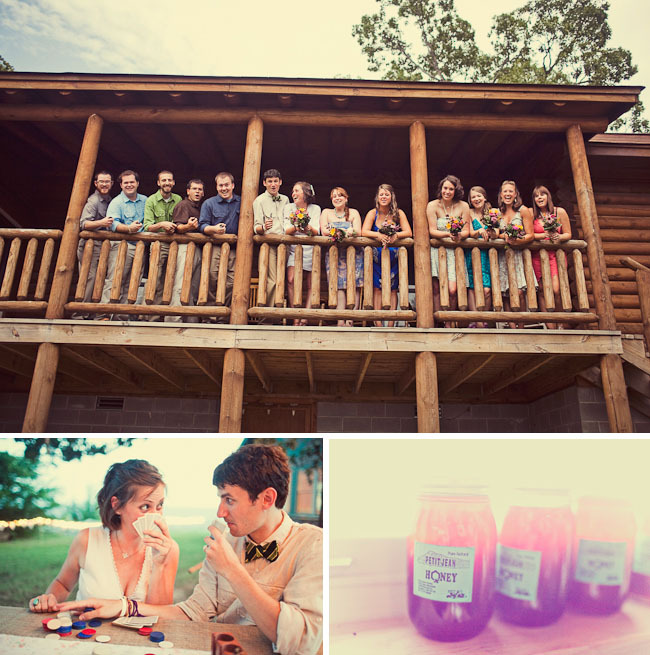 So, from all of these inspirations, our Arkansas, thrifted, potluck, picnic, beer-in-a-canoe wedding was born! Any advice for those planning now? Tap into your talents. I love to sew, and my mom has a serger, so making the altar linens and bunting was a snap. The wedding really became a creative outlet for me when I needed one. Believe in what your community is capable of. My bridesmaids threw me a crafting shower in lieu of a more traditional one, and we got 200 handmade invitations knocked out in 2 hours. Also, we faced a lot of doubts about the potluck dinner, and even though not a lot of people signed up on the registry we made for it (using alternativegiftregistry.org ), it was a smashing success, and our people came through to give us the most amazing dinner (and bacon-inspired pies!). Roll with it. When we realized how hot it would be on our wedding day, we just switched up the schedule. Dinner (in the AC) happened first, then the ceremony, and by the time the party moved outside, it was quite comfortable. Sometimes, being a two-dress bride pays off… like when someone accidentally splashed some red wine onto my dress at dinner. I had a back-up for the ceremony! We just moved into our first apartment, and I love having decorations from the wedding that fit our style so well that they look perfect in our home. It was also fun giving away strings of cranes and bunting (and leftover wine) to friends that helped tear down the next day. Wedding Dress: The sleeveless dress was from casual living (my mom found it for me!). It was originally very white, so I tea-stained it, and it came out perfectly. The one with sleeves is a swimsuit cover up I got on sale at Target for $13 and added the pleated fabric to the V-neck so it wasn’t quite so cleavage-y. Bridesmaid Dress: They all wore their own. Floral Design: My stunning sister, Lisa Gee. She used to work in a floral shop and do fancy weddings, but now she lives in Japan. Catering: Self-catered and potluck. We provided the meat dishes (hamburgers, barbecue pulled venison, and blueberry steak tips) sourced from Brooks’s Uncle Bill’s small family farm, and the rest was potluck. Thanks so much Katie for letting me share this super sweet wedding today. Katie is located in Springfield,Missouri and available for travel worldwide. You can see even more from this wedding here on her blog. :) And best wishes to Becca + Brooks! Your wedding looked so fun and full of love. This has to be my favorite wedding on this site so far. 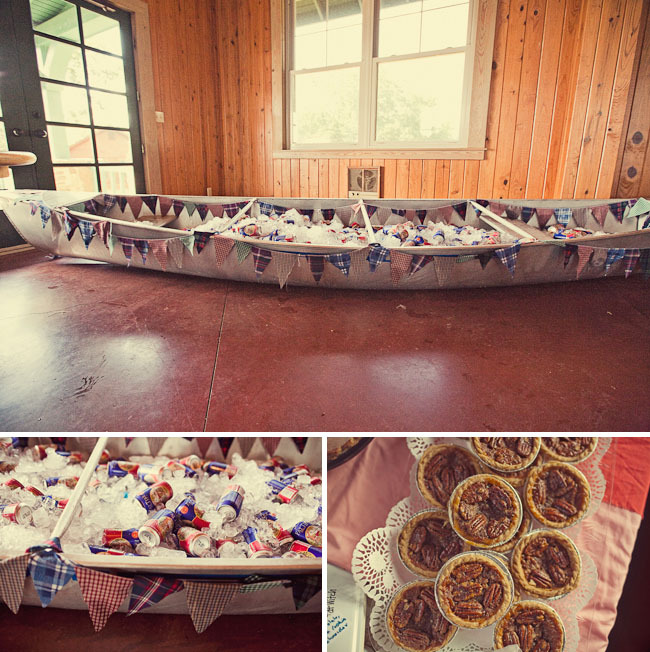 I love their potluck idea, and the beautiful and simple self made decor. This seems like a very green wedding, and a memorable one. 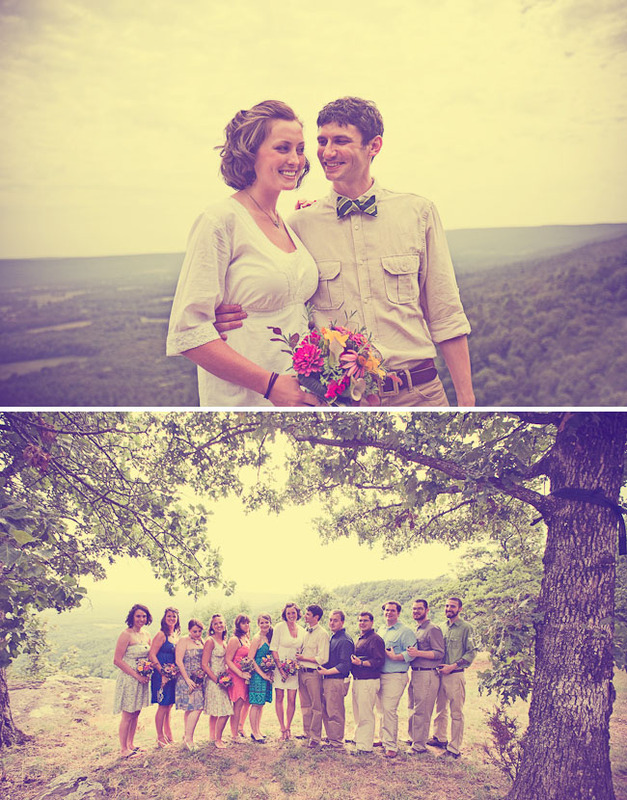 Love this wedding by Katie!! So full of vintage fun! Cute, cute couple. Her wedges and short dress are adorable and the whole casual chic vibe is perfect. aw, i LOVE their first look! so, so sweet. 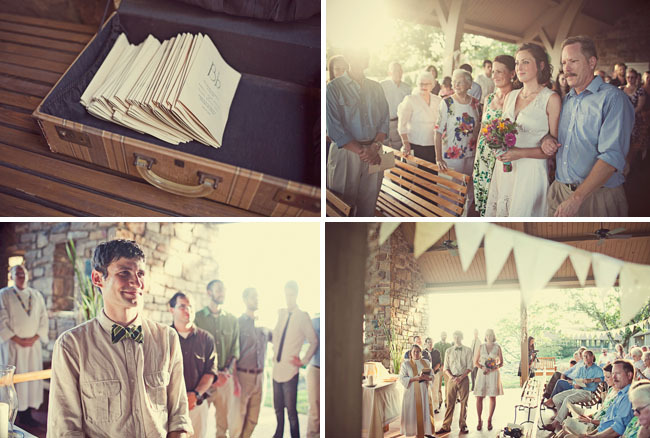 This wedding is so relaxed and lovely! I love the bride’s simple sundress! This vintage look is sooo popular right now. I love it! i know this may be slightly strange, but coming across this post took my breath away — i attended church camp at Camp Mitchell when i was a little girl, TWICE!! just gorgeous, and the memories i have there are priceless. Yeah for potlucks! I am having a vegetarian potluck wedding in September, everyone seems really excited about it and I am sure it will be a blast! I do love your cards go in the old suitcase idea, well done! 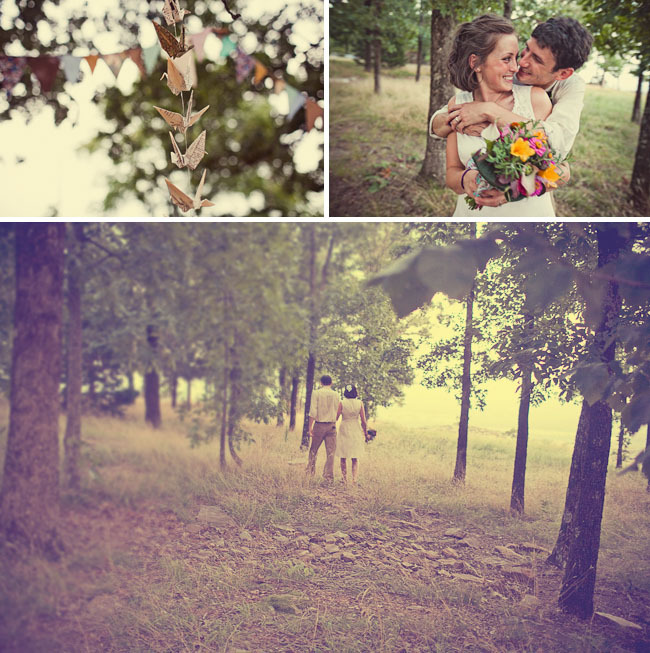 This is the most fantastic wedding I ever seen …so natural. um, canoe full of beer? how ridiculously cute is that!! Sooo… adorable. This is my dream wedding. So casual and laidback, yet sincere and lovely. This wedding SCREAMS STRESS-FREE!!! love the canoe full of beer! 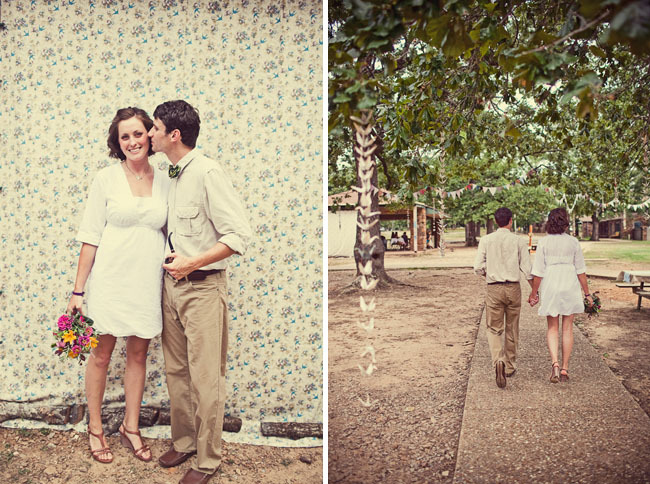 this wedding’s super cute! Oh so lovely. i’m having two dress envy! I love this wedding so much! 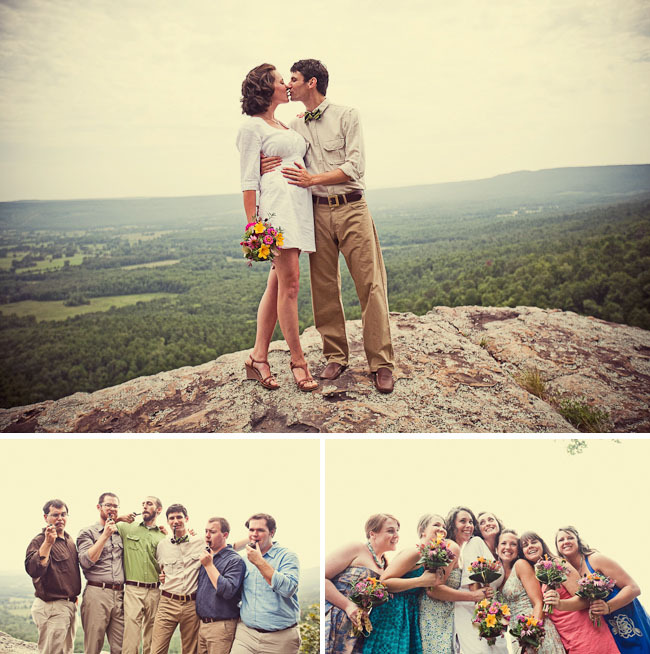 It’s so personal and these photos make me want to be friends with the bride and groom. What a fantastic idea for a wedding venue. It would build such a fantastic sense of solidarity having everyone staying there and doing activities. Love it! Wow. 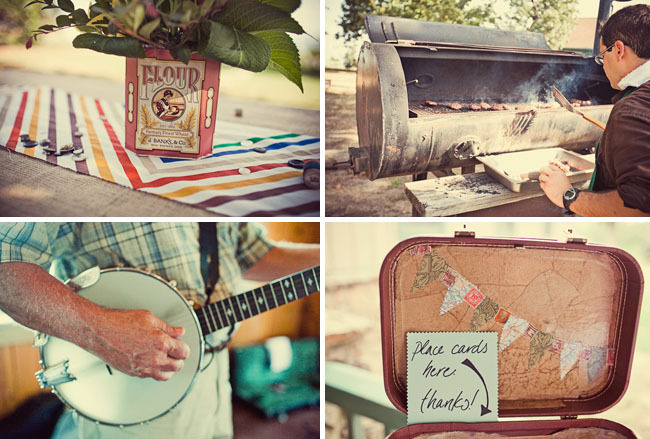 What a great rustic wedding – very laid back. 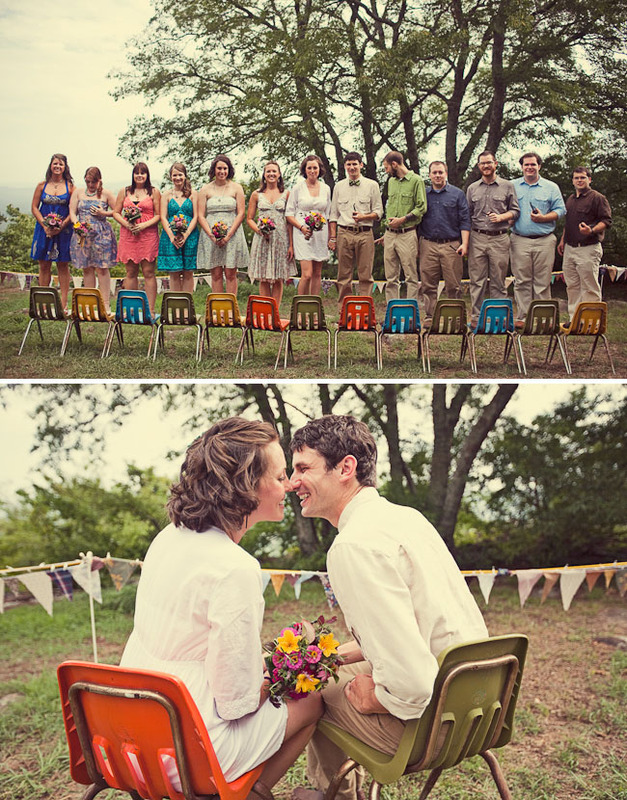 love that photo of the entire bridal party on the colorful chairs! Wow. 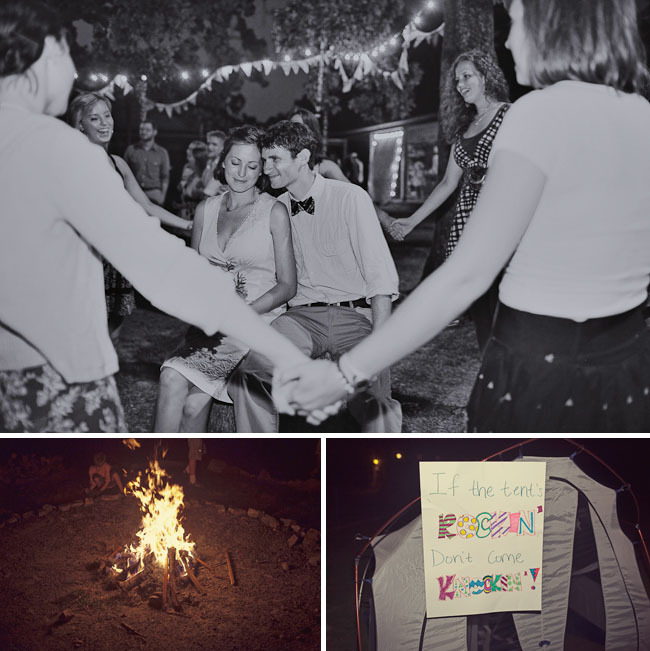 I seriously thought we were the only ones getting married at a campsite in Arkansas! Next month, we are doing something similar…LOVE the inspiration here. The pictures are wonderful, the location…AWESOME! Good luck in your marriage and congrats on a beautiful wedding! Hand crafted weddings are just so much more special! I love it! Oooo I love those wedges. I wish I could ask her where she got them!! Love the colorful chairs — where did they get them from?? I need to rent some chairs & it would be awesome if they were colorful like that! What a beautiful wedding! I love the rustic, colorful feel. Love love love those chairs and the whole party on them. This is completely wonderful. 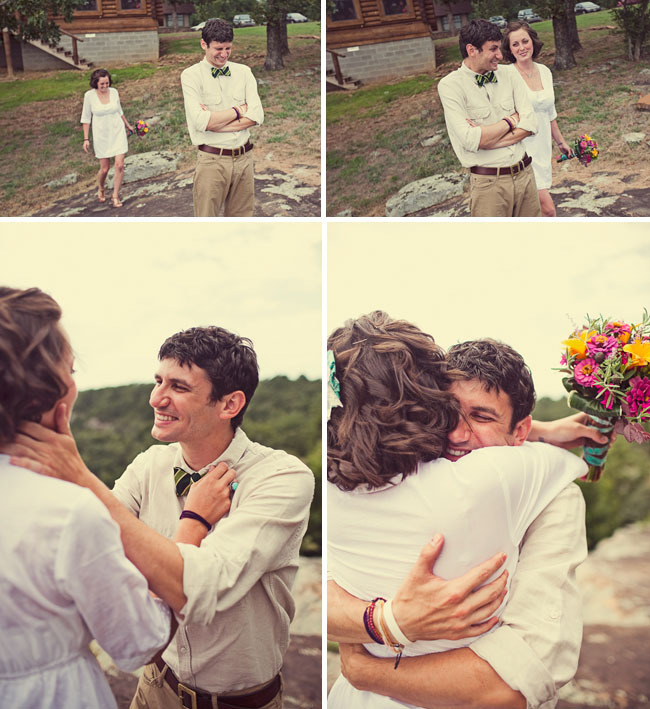 The “first look” at the bride by the groom is just the sweetest thing–so honest and joyful! Love this!!! 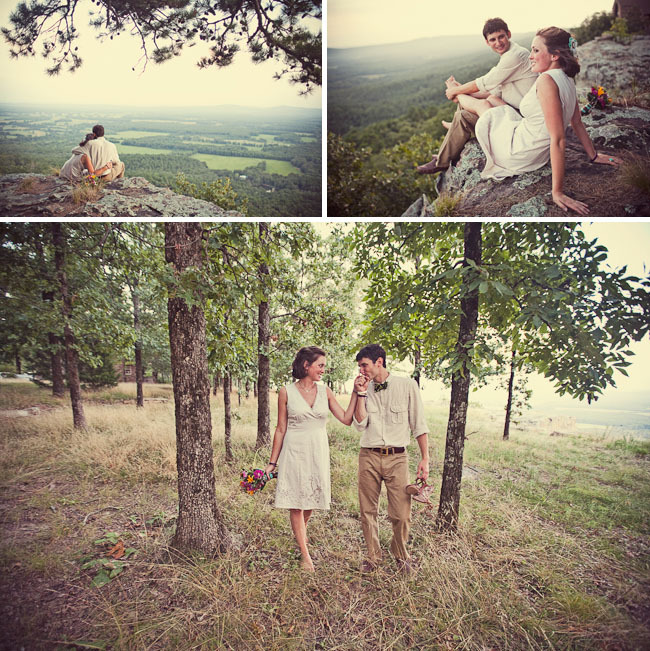 and the picture with them on the rock overlooking the forest….. uggghhhh, can someone say GORGEOUS!!!!! Love the vintage details. 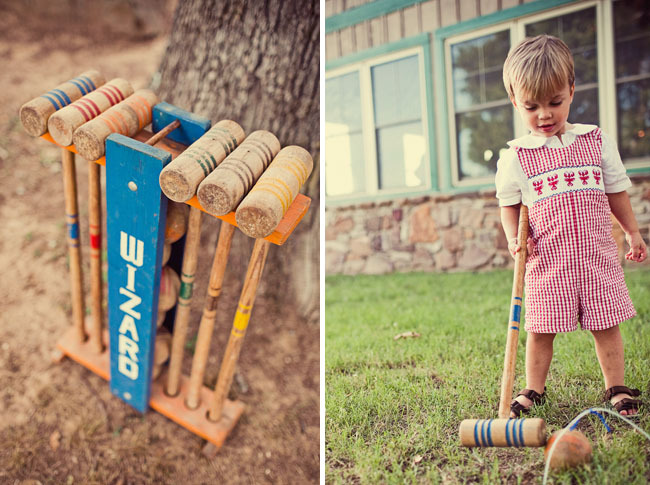 Awesome styling and photography!